Made Yourself A Great Athlete! The story of Sportspeed is the story of a lot of families. Our athletes worked hard, but were too slow to take their game to the next level. So, we started training for speed. And then things took off. In addition to being a supplier of speed and agility equipment to coaches, trainers, schools, and individual athletes around the world, we also train athletes. We understand the challenges and struggles athletes have, and we believe we can help you get faster in your sport! It’s important for you to have a trainer because they will teach you correct form and technique. It’s also important for you practice what you’re trainer is teaching so that you will improve your repetition between training sessions. If you don’t have a trainer, can’t afford one, or maybe a trainer doesn’t live in your area, our speed and agility kit comes with an instructional DVD training series that you will find invaluable! Athletes need to develop their big muscles and core strength for power. However, the “first step explosiveness” comes from the smaller muscle fibers in your hip flexors, glutes, calves, and hamstrings. 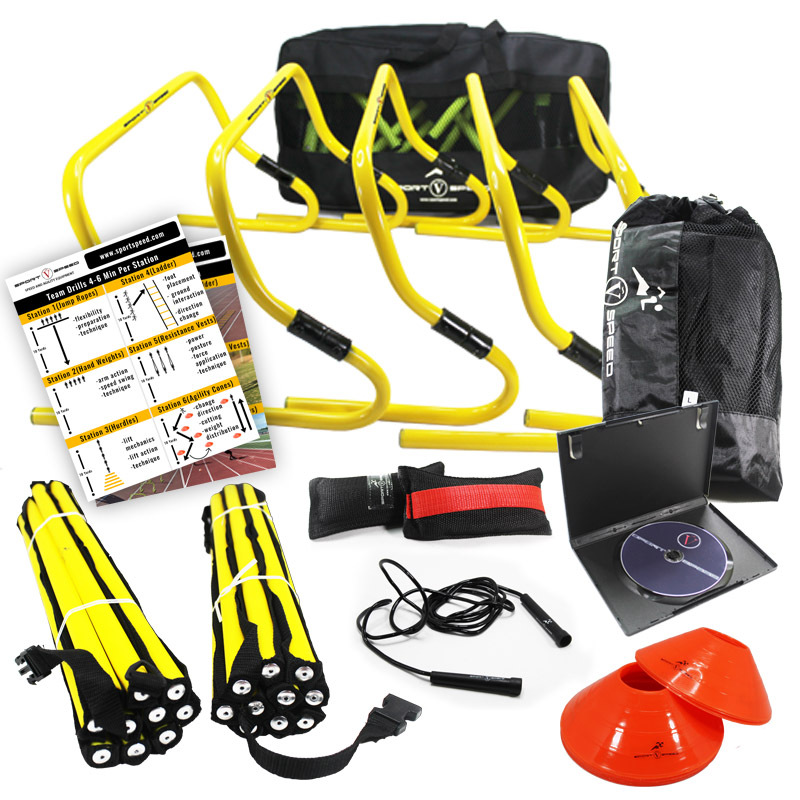 This is where we can really help you with our complete speed and quickness training kit that includes everything you will need for speed, agility and quickness training. You will have a complete speed and quickness kit that is portable and can be carried anywhere for quick set up. Our goal is to help you get faster in your sport. A commonly asked question we hear is “Can I get faster”? The answer is YES! Our speed, quickness, and training kit offers you the resources to help you practice good form, technique, and repetition so that you can excel in your sport. So get your speed training kit TODAY and let us help you get started! Have questions, comments, or concerns about our products or your orders? We’d love to hear from you!